Breast cancer is the second most common form of cancer in women, with 1 in 8 women developing some form of invasive breast cancer in their lifetime. Hidden Valley Mine recognises the extent of this illness and the effects it has on the workforce and their families and that it is treatable with the right monitoring and treatment. Martyn Campbell, Harmony Health Safety & Security Manager said this during the mine’s activities to mark the Breast Cancer Awareness Day on October 26. The mine employees wore Pink safety uniforms on the day to send a message of support and love to breast cancer survivors and also inform its workforce about breast cancer. Mr Campbell said Harmony Gold recognises the importance of supporting its workforce and the wider community to remain healthy and has taken this important step in promoting breast cancer awareness. “This is the first time Hidden Valley mine has undertaken this sort of event. We purchased pink Breast Cancer Awareness shirts and offered them to our workforce for sale. The money raised is being donated to a Morobe Breast Cancer Clinic to assist their treatment of this illness. 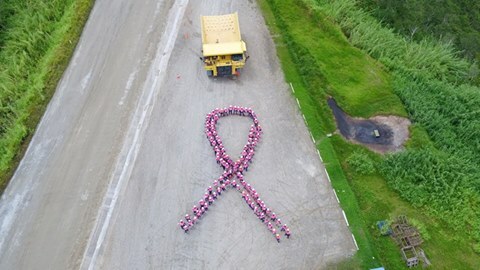 It has been a huge success with the majority of our workforce wearing pink for the day,” Mr Campbell said. Harmony Gold CEO, Peter Steenkamp, visited the site on the day in his pink shirt, stating it was the first time in his career that he has worn a pink shirt at a mine site. Mr Steenkamp reiterated the company’s full support towards the initiative and its support to the local community to stay healthy. Employees carried out talks on Breast Cancer through toolbox meetings and safety shares leading up to the day. The awareness was educational and covered basic understanding of Breast Cancer, its signs and symptoms, possible causes and treatment. Anna Papat, Business Improvement Superintendent, said the awareness was a very good initiative to bring the message home that cancer does not have boundaries. Mike Merena, Safety Coordinator, said they also spent October spreading the word about women having mammogram checks and supporting those with the illness.